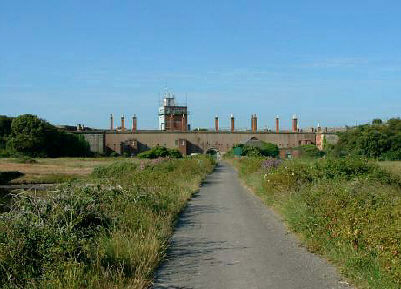 Fort Monkton is still used by MOD. It was constructed in 1778-90, probably on the site of Haselworth Castle which was built in 1545 but has since vanished. In 1872 it had just two 7" RBL guns as it had only a minor defensive role, the main armament being sited at Gilkicker Fort. Gilkicker Fort is a small raised fortification started during the 17th century and rebuilt during the 1860's to prevent landings at Stokes Bay behind the ring of Gosport forts which faced westward. By 1884 it was heavily armed, with twenty seven RML guns of 9" to 12" caliber. It was modified in 1902 with the outer ditch being filled and earth being piled up against the casemates and outer wall for additional protection. The armament then consisted of two 9.2" and two 6" BL guns. It was used during World War 2 and is now owned by Hampshire Council. It has now been converted into housing. Gilkicker Fort and Fort Monkton are not open to the public.